We focus YOUR specific program to run the way you would like it to. Can be paid for by the patient or the practice. Reduce unnecessary calls or appointments. Help your patients have a lower stress level during pregnancy. Tailor care to patient needs, preferences and lifestyles. Using a high-quality Doppler at home helps monitor fetal well-being, reduce stress and increase bonding with baby. BabyBeat is the largest distributor of home fetal Dopplers. We are committed to supporting healthcare providers - no other company has a record like we do. 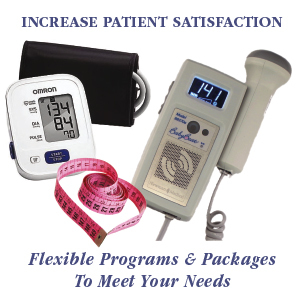 Our quality control process ensures your patient receives the best equipment. We continually add new equipment with the latest, most up-to-date technology. Our partnership program is available at no cost or obligation to hospitals, offices and healthcare networks nationwide. Please contact us for a free OB-Focus Program Kit or more information at info@babybeat.com or 1-888-758-8822.